I am glad that I rewatched "The Hours." My first viewing of the movie when it was released in 2002 found it to be just OK, but now that I have read "Mrs. Dalloway" twice more, many reviews and other articles and really paid attention, I truly enjoyed and understood the movie. It proved to be an Oscar win for Nicole Kidman as best actress in her portrayal of Virginia Woolf though many Woolf scholars were horrified by both the book from which the movie was made and the film. And some like one, but not the other, while a few even enjoyed both. But, for me, with a cast that included Meryl Streep, Kidman, Julianne Moore, and Ed Harris, the movie was worth the time it took to watch. Apparently those same Woolf scholars who disliked book and movie were most dismayed that Virginia is played as quite frail and mentally unstable, an image that current biographers are trying to dispel. No one denies that she had psychological issues, but they didn't stop her from being an amazingly innovative and productive writer. I got a kick out of one article which focused on the prosthetic nose that transformed the gorgeous Kidman into a very believable Woolf look alike. The movie Virginia is really a bit plain and very badly dressed too. 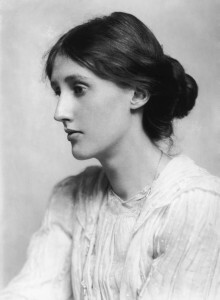 Portraying her in that way is disparaging as Virginia Woolf was considered a great beauty in her day. And, it is misleading that it shows her drowning herself apparently after just completing "Mrs. Dalloway," when, in fact, it was written more than twenty years before her death. The movie has three storylines which occur in three different time frames, all tied together by the common theme of suicide. And, in each, "Mrs. Dalloway" is readily apparent. Julianne Moore's character is reading the book, Meryl Streep is named Clarissa, and all the while there is Kidman as Woolf writing the book. Having always felt a kinship with Virginia Woolf, I am now increasingly interested in her life and in reading more of her books. Plus, I ordered a copy of "The Hours" just because. The Quentin Bell biography of Woolf is my favorite. He was Vanessa's son and Virginia's nephew, so I wouldn't call it an objective biography. But perhaps that's why I liked it. If you're interested in finding out more about the whole Bloomsbury milieu, I hardily recommend Michael Holroyd's biography of Lytton Strachey. True, it's three volumes long. But it's fascinating. Have read and liked Quentin Bell bio, am rather daunted by the thought of 3 volumes, but intrigued now. Truly, Holroyd's Lytton Strachey bio reads like a novel. Well now you've got me wanting to read it, so many books, and a lot of time to fill, and, of course, Amazon has it and quite cheap too. They also have what appears to be a much shorter version, same author titled, "The New Biography." I'm lazy, wonder if it would be as good, although thinking probably not. Have read Byatt, but not Drabble. Will add her to my list. Any recommendations for a first read? I would go for the 3-volume Strachey bio myself. If for no other reason then to immerse yourself in the life of the mad, doomed Carrington. Lytton Strachey and Leonard Woolf were BFFs, so there's the extra perk of seeing Mrs. Woolf - Virginia - from a perspective you're not used to. I was very fond of Drabble's The Millstone. It's probably very dated now -- it was written in 1965 -- and maybe I wouldn't like it if I read it now. Haven't read any of her more recent stuff. Her writing style is very, very different than Byatt's so that's interesting, too. I thank you as does Amazon hah! Interesting observations about "The Hours." A while back, the grand daughter who is 10 and an avid reader was having a discussion with her 8 year old sister. The younger sister reads too, but is not quite the die-hard, book-in-hand-every-waking-minute fanatic that her sister is. Anyway, the younger one had opined that she didn't need to read the the book that her sister had just finished because she had seen the movie. And was then subjected to quite a learn-ned discourse as to why that just wasn't valid. I laughed when I heard about it because I had just bought a fancy bookmark at B&N which said, "You can't tell a book by its movie." In the meantime, the older sister had convinced me that I absolutely must borrow her copy of one of the Harry Potter books which she had also recently devoured and so, when I returned it, I left the aforementioned bookmark in it for her. Fast-forward (finally! right?) to my ill-fated book club at which the moderator, a paid employee of the library, no less, declared that she had not read the book but had watched the movie! At which point the whole conversation pivoted away from "Dalloway" to "The Hours." I was already reaching for my copy of "Dalloway," to flash the bookmark in silent protest, when I remembered that I'd given it away. But I've gotta say, having read your comments and having fulfilled my moral obligation to actually read the g*dd*mn book, I'm now legitimately interested in reading "The Hours" and seeing the movie. FYI, I watched the movie for $2.99 via Amazon Prime which gave 48 hrs of rental time. I fell asleep the first time and was pleased to have the extra time so I could start over in the daytime when there's a much better chance for me to stay awake. And, at least it was a flick that didn't require a huge amount of emotional investment and I was able to watch it dispassionately with a more analytical bent. Interesting sidenote I forgot to mention in the post is that after "The Hours" appeared in theaters, sales of "Mrs. Dalloway" suddenly soared and it became a best seller for the first time since it's publication in 1925. I'm considering delving further into the whole Blomsbury group as a bio of Lytton Strachey has been recommended to me. Might as well live in the past as the future seems so unappealing. Oh, and used copies of "The Hours" are going for $4 on Amazon and if you don't get one of your own, will be glad to send you mine when I've finished it. Yes, Amazon loves me..lol My bookshelves, while plentiful are very full. Hahaha, Amazon loves me too because I just pushed the button on an order for the book and movie. But thank you for your kind offer. And my bookshelves are full too but only because they're NOT very plentiful, lol. FINALLY got started on "The Voyage Out" this morning while I waited for my car to be serviced at the Subie dealership. The coffee was awful, even though free, and the ambiance was, well, not really conducive to the enjoyment of great literature. Hmph! In the meantime, it's taken me numerous tries to write this comment because I just finished a bottle of totally inferior Scotch ale. If it'd been the good stuff, which they only brew locally once a year, I'd've had the same problem but wouldn't have cared, lol. Hmmm..Subie = Subaru? Curious, that's my current ride, a blue Legacy. Tis a cold, dark, and stormy night here in the boondocks. I wish you better ale next time friend. Yup, charcoal gray Forester, complete with an electric tire pump because it has a leak in one of the tires that nobody can find. I mean, they can find the tire but not the leak in it. But I console myself with thoughts of "The Hours," book and movie, now making their way towards me and the grandson coming here tomorrow to work in the shop. I loved The Hours. I still listen to the soundtrack regularly. And that's what made me want to read Mrs. Dalloway, originally, which I've now started and realized I'll probably finish before I finish To The Lighthouse. Interesting. I just started "To the Lighthouse." Now I am going to see if I can find the sound track to "The Hours." Amazon has everything, maybe? Oh, Amazon came through, such lovely music. Thank you. I was also put off at how dowdy Virginia was played in the movie and it's become an accepted portrayal of her however inaccurate. Did not read the book it was based on but am curious as the story of the other 2 characters in words. Remember the movie being engaging and likable enough to watch more than once. I'm about 2/3 of the way thru the book and as always much more depth in other characters than in movie.